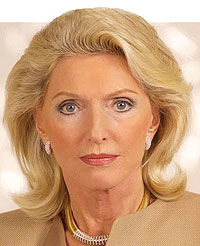 Maria-Elisabeth Schaeffler (shown) and her son Georg acquired 90.2 percent of Continentals stock, plus four board seats and the chairmanship. But at what price? MUNICH -- Maria-Elisabeth Schaefflers success in winning control of Continentals supervisory board leaves her with an even tougher challenge: Can the new entity get out from under its mountain of debt? In principle, Continental and Schaeffler Group will integrate their automotive businesses and create a global champion that threatens No. 1 supplier Robert Bosch. The combined supplier giant would have automotive group sales of about 22 billion, which would put it among the top five suppliers in Europe. But the acquisition by Maria-Elisabeth Schaeffler and her son Georg of 90.2 percent of Continentals stock, the chairmanship and four supervisory board seats has come at a big price. As the automotive industry passes through its worst crisis in 15 years, the combined Continental and Schaeffler companies owe banks 22.8 billion. The annual interest payments come to about 1.2 billion, according to a source familiar with the matter. Schaeffler accumulated 11 billion in debt from the Continental purchase, an amount which exceeds its 2007 sales of 8.9 billion. Continental still has a large debt from its 11.4 billion acquisition of German supplier Siemens VDO in 2007. After analyzing the combined Continental and Schaeffler unit, Continental chief financial officer Alan Hippe recently said that the operation lacks sufficient equity capital. Shortly thereafter, he resigned to take the top finance post at diversified steelmaker ThyssenKrupp. It does not help that Continentals share price has plummeted since the Schaeffler acquisition. When Schaeffler announced its intention to buy up Continental shares at 75 a share, the share price was around  30 a share. As of January 28, the price had plummeted to 14.08 a share. Schaeffler and Continental could get 1 billion in aid from the German states of Bavaria and Lower Saxony, where the two companies are based. But Lower Saxony Prime Minister Christian Wulff demanded to see details of the business plan of the future enterprise as a condition for any aid, a source close to Continental said. To overcome Schaefflers financial crisis, Continentals new supervisory board has agreed to spin off the tire and rubber-parts division, one of the worlds largest tire makers. Mostly thats the first step in disposing of a part of a company, said Christian Mueller, consultant at IHS Global Insight. Standard and Poors warned investors that Continental would default on its debt by August 2010 if management had not sold its tire business, a key cash flow generator for the group. Meeting this target would only be achievable if the company were to sell its rubber activities, the ratings agency said in a statement. A Continental source said that the business was worth about 7 billion before the crisis. Now Continental will get only 3.5 billion to 4 billion for it, this source said. The company already has tried to sell the division to reduce its debt burden but could not find a buyer in the current poor economic climate. Hubertus Von Grünberg, the Continental chairman who gave up that post in an emergency board meeting on Jan. 24, will continue to be in charge of finding a buyer. His vast network of contacts is seen as key in this divestment. After (former Continental CEO) Manfred Wennemer and Alan Hippe, he is the only remaining person who could be able to interest companies in the rubber group, a source said. Wennemer left the company last year. Continentals new chairman is expected to be Schaeffler lawyer Rolf Koerfer, a Dusseldorf-based partner at law firm Allen & Overy.